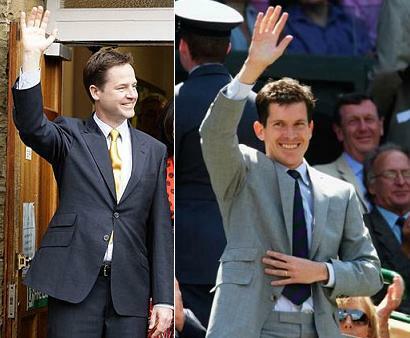 Clegg and Henman: Separated at Birth? So Thursday night’s election results were quite the anti-climax for the Lib Dems, worthy of England’s most disappointing tennis player. Feverish polls which had predicted a 30% vote share proved wildly inaccurate, with the third party even winning fewer seats than in 2005. It seems that the impact of the television debates has been grossly overstated, as The Times’ chief leader writer Daniel Finkelstein predicted at the very start. There are a few key points to conclude from this. Firstly, that voter allegiances run too deeply to be significantly affected by three televised debates, which, lest we forget, less than 20% of the country actually watched. Secondly, that for the Lib Dems to ever stand a chance of unseating Labour, we will need drastic electoral reform, probably in the form of proportional representation. Thirdly, that faced with the option of voting for an unproven party in the middle of an economic downturn, the electorate bottled it, and understandably so. No time for a novice, indeed. However there are a few silver linings. Firstly the Lib Dems could achieve significant gains from a hung parliament. As I write this, the Yellows are believed to be considering a power sharing deal from David Cameron which could see Lib Dem MPs in the Cabinet and even limited concessions on electoral reform. Secondly the fringe parties such as the BNP, UKIP and Respect failed spectacularly. Nick Griffin polled third and was verbally tarred and feathered and chased out of town by Margaret Hodge, Nigel Farage’s plane crashed, George Galloway even wimped out of hearing the verdict of my constituency, who roundly rejected him. Thirdly the Green Party took a big step forward by taking Brighton Pavillion to make Caroline Lucas their first ever MP. At the end of such an extraordinary election it is easy to see this as a victory for those same two parties who we’ve been stuck with for 80-odd years. But the more you inspect the results and consider the implications of a hung parliament, it becomes clear that politics in the UK just became a lot more open and far more interesting.